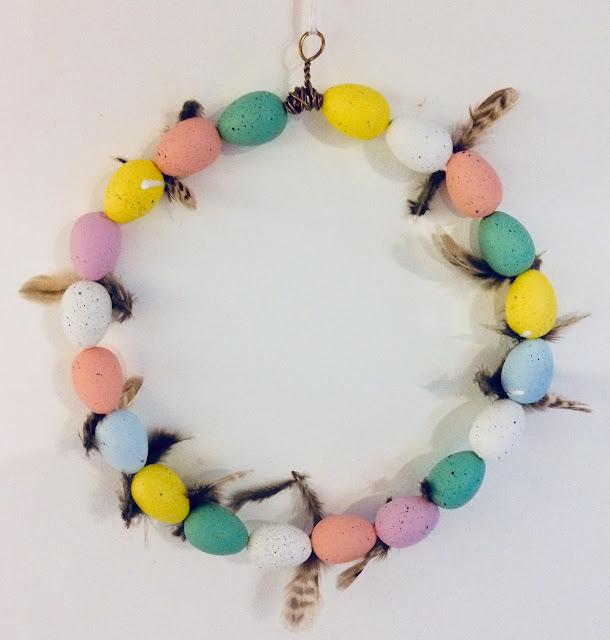 To decorate the front door for the Easter Brunch that's coming up in our house, I made this Easter Wreath with left overs from the wire bunny that I made a couple of weeks ago and the pheasant feathers that I used last week for a center piece. The only thing I had to buy were faux eggs. I made hole in it with a screw and threaded the eggs over the wire. Then sticked feathers on the eggs and that was it. About ten minutes of work. 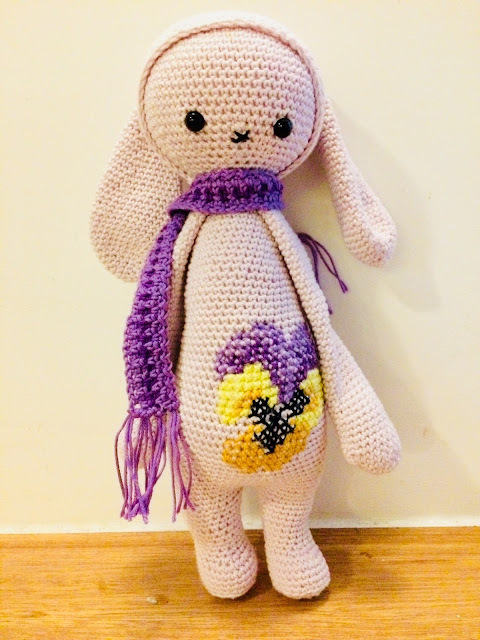 My Lalylala Spring Bunny was featured by Creative Jewish Mom and by Scrapality! Thank you very much, Sara and Andrea! 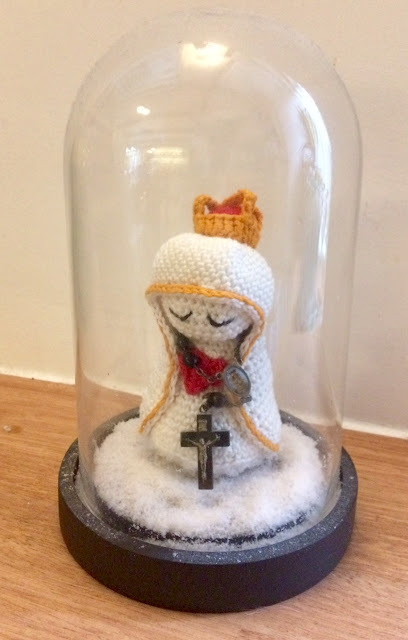 In my Pinterest feed I got some pins of crocheted 'Nuestra Senoras'. They made me think of a trip to the Spanish Island of Lanzarote, belonging to the Canary Islands, a couple of years ago. We were there in the week of Semana Santa, the week between the last sunday before Easter (Dominica in Palmis) and Easter itself, because we wanted to visit one of the processions in the capital of the island, Arrecife. Like the rest of Spain the Canary Islands are mostly Catholic, so religious days are celebrated with a lot of pageantry. The most beautiful statue that was carried around was of the Virgin de los Dolores, also called Virgin the Los Volcanes, who is the patron of the island. Volcanoes are found everywhere on the island, all Canary Island are volcanic. This is what the 'real' Virgin de los Dolores really looks like. Normally the statue can be found in the charming little white church of Mancha Blanca, a small village on the island. 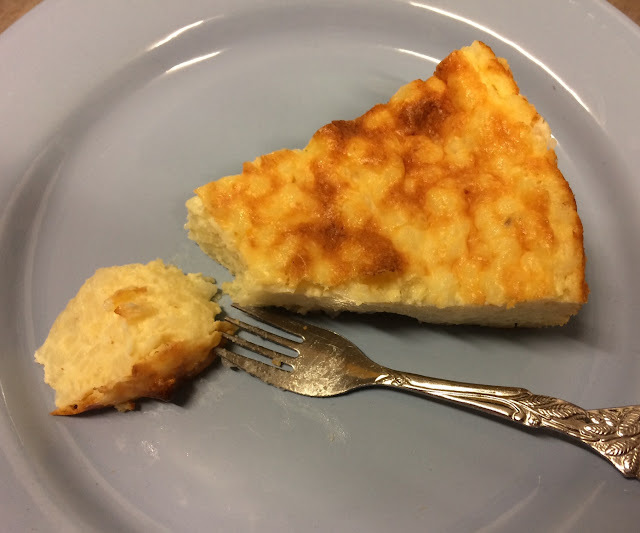 This week I made the French Cheese Soup with Croutons. We all like cheese around my house, but making soup with cheese is something different. It wasn't all oohs and aahs. I was the only one who liked it, although it tastes much like Cheese Fondue. My husband and children don't like Cheese Fondue either, so that makes sense. Anyway, this recipe didn't make the 'To Keep-list'. The little Garlic Bread Wheels that I made to go with the soup were a total hit on the other hand. And so simple to make! This weekend my family will come over for an Easter Brunch, so I made a flower centerpiece to fill the table. First I cut the tulips off about 10cm under their head. To stop them from growing, I pierced a little hole just under their head with a needle. 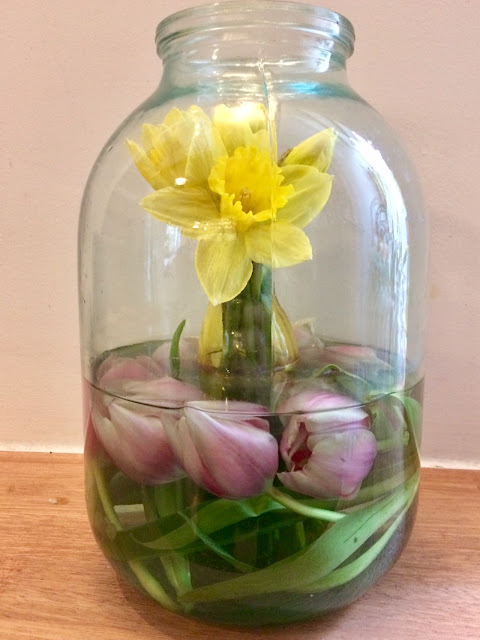 I filled a jar with water and arranged the tulip heads in a circle along the edges of the jar. Then I put the daffodils in the vase and the vase in the jar before they were blooming, so the flowers wouldn't break off because they were too big. After two days the daffodils started to bloom and now the centerpiece is ready to show off. After some vain hope a couple of times I think spring is finally coming to Western Europe. Only a bit of cold weather in the forecast for this weekend and then temperatures will rise, I hope. In my garden some of the flowers came up weeks ago, but only started blooming this week. As promised here's the Rice Cake. Not as delicious as I thought it would be, I missed the hearty taste of a crust. Next time I will try to make this as a tart. Do you like cheese? I looove cheese. All sorts of cheese, but especially the ripe ones. 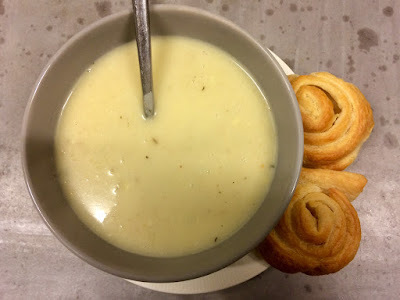 So when I found this recipe for French Cheese Soup with Croutons I knew I had to make this one day. This day will be somewhere in the upcoming week. Normally I don't really decorate my house for Easter, but because there will be a brunch at our house for my family I thought the house will look nicer when there's something on the table that has to do with Easter (besides our own Flemish Giant Haasje of course, who's the best Easter Bunny ever!). So I bought paper eggs, paint, real eggs and pheasant feathers. The real eggs came in a carton box and the box was what I needed (well, I could use the eggs, too, but not for this decoration project). Painted the eggs and let them dry Covered the eggs in Modpodge Sticked the feathers to it Covered eggs and feathers again in Modpodge Put the eggs in the carton box Arranged them on a serving plate with daffodils, a bunny and the rest of the feathers. 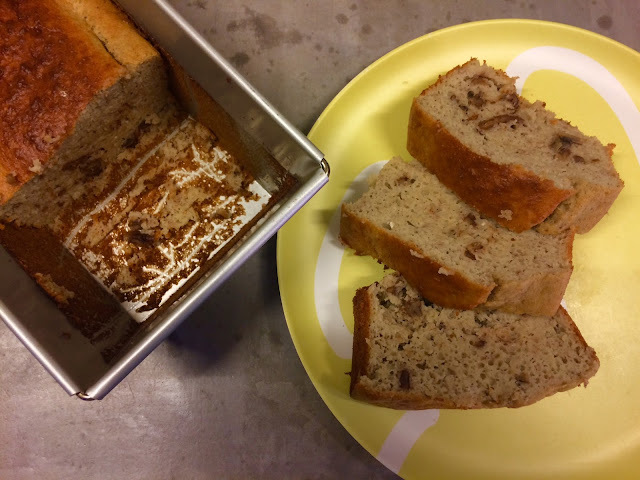 Banana Bread recipes are popping up everywhere and when I found one without sugar, just the sweetness of the bananas themselves, I thought I should give it a try. Not that I'm against sugar, because I looove sugar, especially when combined with chocolate, but it doesn't any harm to have at least one sugar free recipe in my cookbook. So here is the No Sugar, Just Bananas Bread and the taste is great! The only thing I changed in the original recipe is that I added pecans. On to next week! 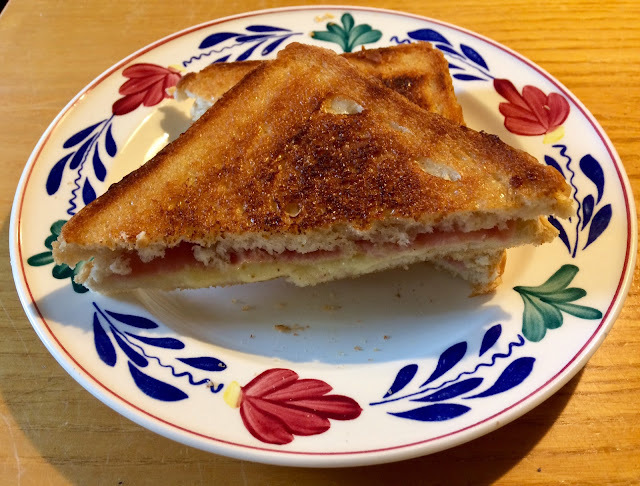 Grilled Cheese Sandwiches with mayonaise! Because the secret to a golden brown and creamy grilled sandwich is mayonaise, as told in this recipe. Mayonaise? I have to try this myself! After some icy cold weeks, we could even skate on natural ice, now spring is in the air. We went from -5 degrees Celsius to 9 degrees in one day and nature came to life immediately. At least in my garden. Now that temperatures are a bit more comfy, I get a feel of summer and summer makes me want to redecorate in boho style. Hence this crocheted boho chandelier. 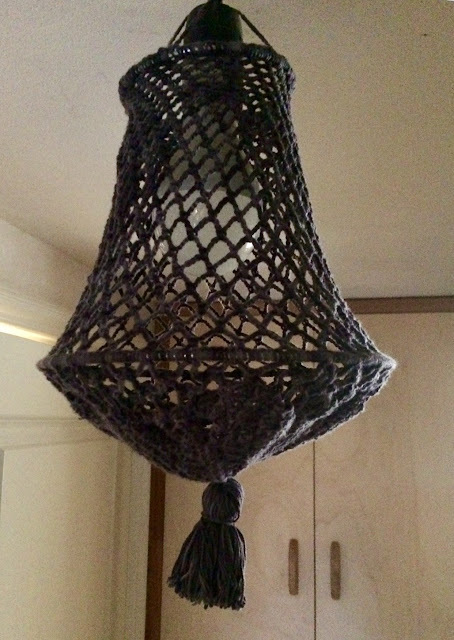 First I crocheted a doily that I attached to a hoop and from there on I crocheted a mesh that becomes smaller to the top of the lamp. I found this idea here and then made my own version of it. My Bunny Wire Pendant was featured by Sew Can Do and by The Answer is Chocolate! Thanks a lot, Cheryl and Carol! 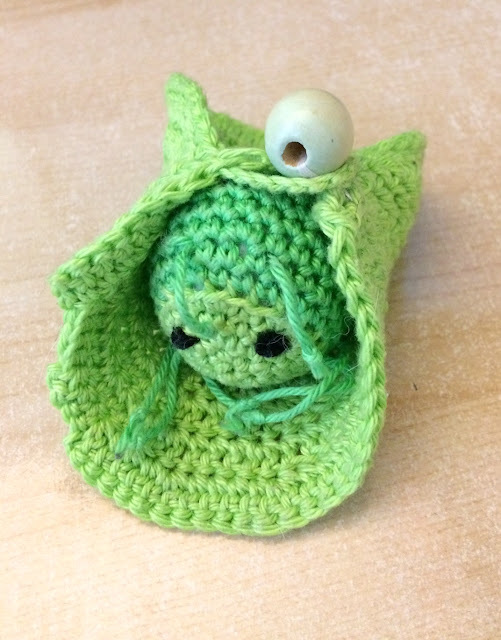 The Little Turtle that I made last week was featured by Oombawka Design! A while ago my daughters and I went to see Coco, the Pixar animation movie about a little boy who wants to find his dead father in the after-world. The movie has the Dia de los Muertos as a theme. We all three loved the movie, even more: I think this children's movie is the best movie of 2017! Besides all sorts of varieties on the Calavera Margarita, there were a lot of other typical Mexican things included in the movie. One of them were alebrijas, fantasy animals from Oaxaca that are painted in bright colors. 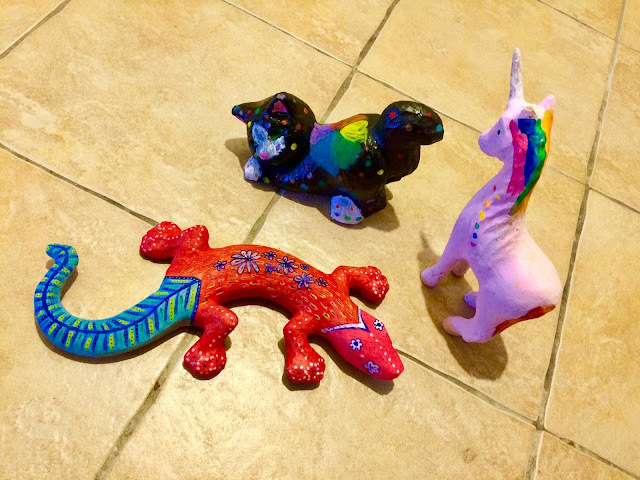 Before the movie I had never heard of alebrijas, but as soon as they appeared on the screen I knew I wanted to make them with my daughters. 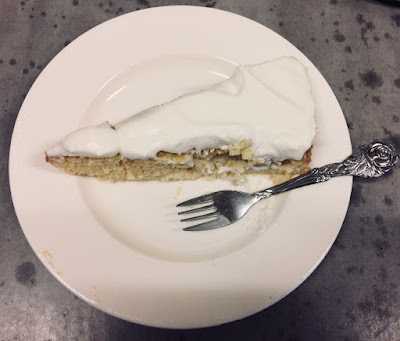 ~Since I pinned lots of recipes on my Pinterest boards through the years, but never made anything from the pinned items, I've set myself a goal to try one recipe per week to reduce the overload~ Have you ever tried Tres Leches Cake? I didn't, but this week I made one for the All Mexican Menu and I found it delicious! Taste, moisture, appaerance: loved it. This recipe is on my keepers list now! For next week I found an interesting recipe for Banana Bread without sugar, which totally fits in the diet I follow. Since my weighing scale was broken I slowly took on a couple of kilo's, so the time's here to lose them again. I only have to lose five to be back on my old weight, so it's not really a big challenge, but eating Banana Bread without sugar as much as I want is definitely going to help, I think. The also very delicious Avocado Black Bean Quesadillas from last week were featured by Scrapality!